We held our 2016 end of season lunch on Wednesday 19th October at the Newport Cricket Club House at New Close. A very large turn out enjoyed a ploughman's lunch and great company. Over a dozen members of the group received grade certificates presented by our president Jean Winter aided by 'examiner', Jill Warren. Certificates are awarded for reaching a standard of skill and knowledge in carriage driving. Two members were awarded special certificates acknowledging achievement during the season. Lisa was particularly delighted with hers! 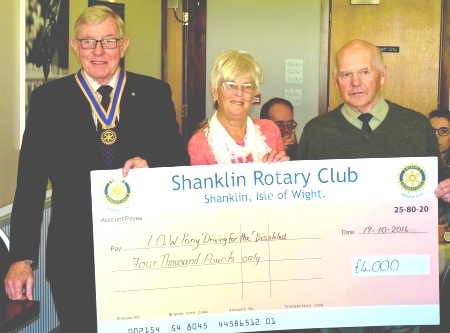 Special guests at the lunch were the president of Shanklin Rotary Club, Steve Knight and his wife. They were there to present the group with a cheque for four thousand pounds to help us purchase another wheelchair suitable carriage. Their generous donation was made after Robert Young gave an evening talk about just how much benefit people get from driving and the dedication of all the helpers that make it possible. We were then informed that we have purchased another suitable carriage and that the donation has made that possible. Saturday 3rd and Sunday 4th September. The Island group of Pony Carriage Driving for the Disabled were in attendance at Wolverton Manor Garden Fair. What a lovely weekend despite the weather. All the volunteers that helped out had an enjoyable time and were kept busy by the huge crowds. The weather tried its best to ruin a great weekend but the worst it could do brought out the best in people. A storm blew through the site during Saturday night and destroyed several display stands, including ours. Our gazebo was blown into the moat along with other bits and pieces. Everyone joined in to salvage the situation with people rescuing things from the deep water of the moat and others lending things and helping putting it all back together. The gazebo however was a wright off. Certainly an unforgettable and enjoyable weekend. Yes I know I am mad - no comments please! But I did it!!! On the 19th June this year at 1500hrs I abseiled 100m down the Spinnaker Tower in Portsmouth, all in aid of raising money for the RDA Pony Driving for Disabled on the Isle of Wight. I was supported by a few friends from the group along with family, all waiting to welcome me back on the ground. Stepping off from a small platform adjacent to the viewing floors of the tower was the most anxious moment. However, once I realised that the rope was going to support me, it all became an enjoyable experience. I took my time lowering myself so that I could enjoy the thrill to the full. The rain held off until I was safely down and enjoying a coffee with my friends. I am pleased to say that my fun afternoon, raised in excess of £1,200 so that people from the driving group can enjoy their days with us. The Isle of Wight Pony Driving Group held a grand garden party on Sunday 2nd August 2015 at Barnsley Farm, by kind permission of Nicola and Nigel Murgatroyd. What an afternoon it was too! We were blessed with perfect weather and a setting that would be hard to beat anywhere. 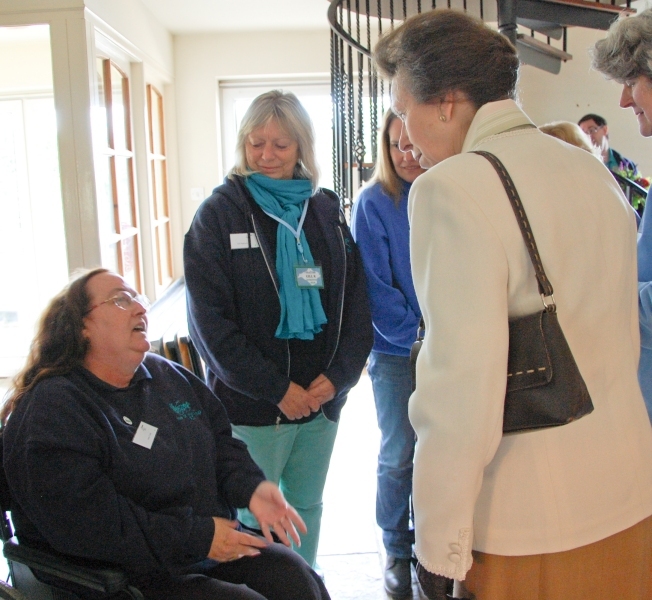 The event was to increase awareness of our group and to raise funds towards a much needed carriage to take wheelchairs. To that end we invited the press to cover the event. Our invited guests included the Island's MP Mr Andrew Turner, High Sheriff Mr Ron Holland and past sheriff, Susie Sheldon. A good turnout of both volunteers, clients of the group and visitors enjoyed a glass of Pimms or lemonade before the event was opened by Mr Holland who spoke most highly about the work of the group. Three of our ponies where there to show what we can achieve. Murray took Diddy for a drive in her wheelchair, thanks to the hard work put in by Robert and his helpers. Several guests enjoyed riding around Barnsley farm with Pat and Pocus. Fred was busy all afternoon because everyone wanted Gail to take them for a ride too. Afternoon tea was as delicious as it looked and was spread out in a marquee where people could read all about the group, buy raffle tickets and items to help with fund raising. As the afternoon progressed, many more visitors were able to enjoy a ride in our carriages, including our honoured guests. A very well supported raffle was drawn and a large selection of prizes won. There were 7 or 8 lovely homemade cakes that were offered for sale by auction. Our auctioneer Nicola worked very hard to part those present from their cash and twisted her husband's arm to buy the '40th birthday' cake. The cake was cut and shared between volunteers, committee members, guests and visitors. 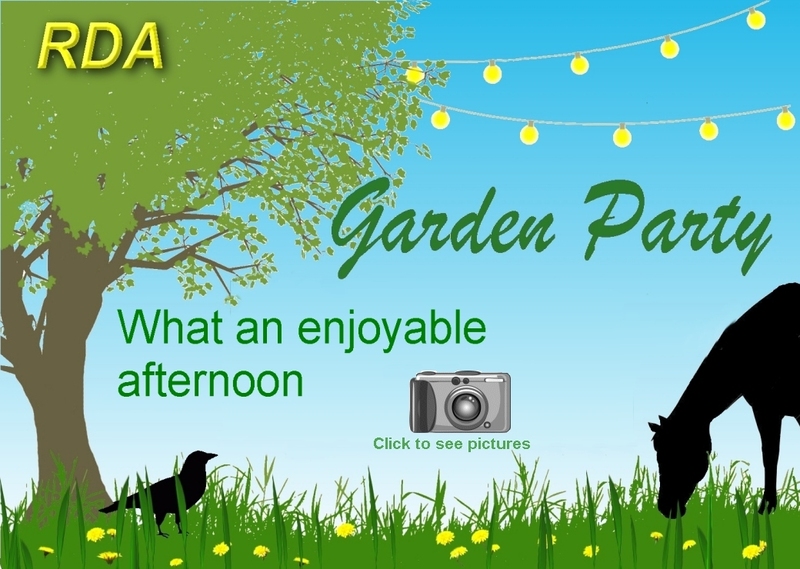 A huge vote of thanks must go to Nicola and Nigel for making us so welcome in their splendid garden and to all the people who made the afternoon so successful. Click the Sainsury's logo to see just how we did it!! Look at the bottom of the list on the gallery page to see pictures of our day out. 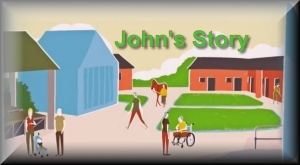 Click the picture to see a short story that says just about everything that being a volunteer means. 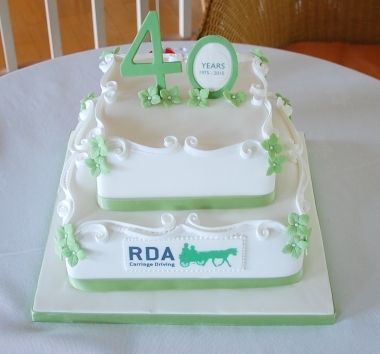 On the 9th June our Island group were proud to be able to help the RDA celebrate 40 years of carriage driving by attending an event at The Unicorn Equestrian Centre, Stow-on-the-Wold. 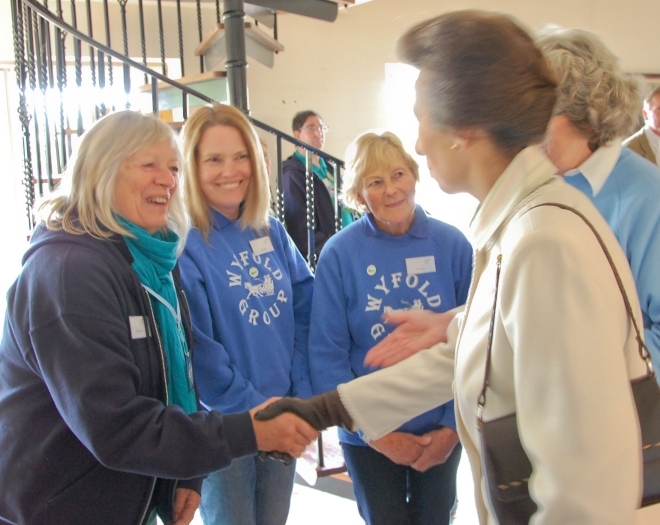 Twenty two members from our group had an early start to catch a ferry to get to the event before the Royal guest, the Princess Royal, Princess Anne. Unfortunately two were unable to reach Stow-on-the-wold due to illness. The day started with time to mingle and have some very much needed refreshments. They were then entertained by various demonstrations and people giving a commentary on the forty years of driving and what the driving groups do today. 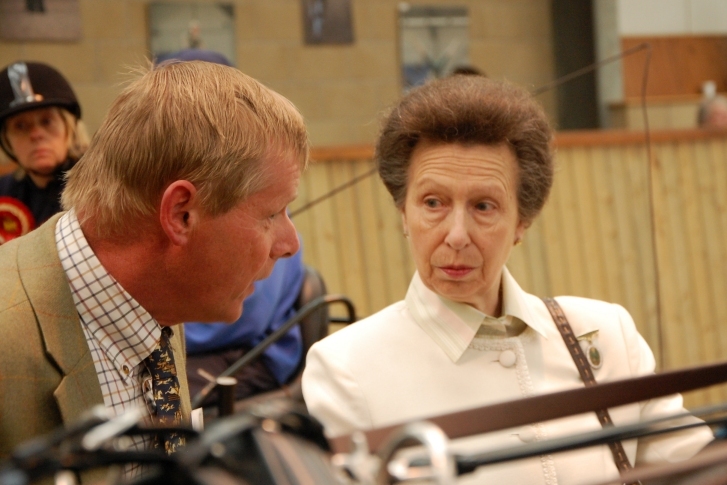 There were awards and presentations before moving upstairs to toast the RDA Carriage Driving while HRH the Princess Royal cut the birthday cake. 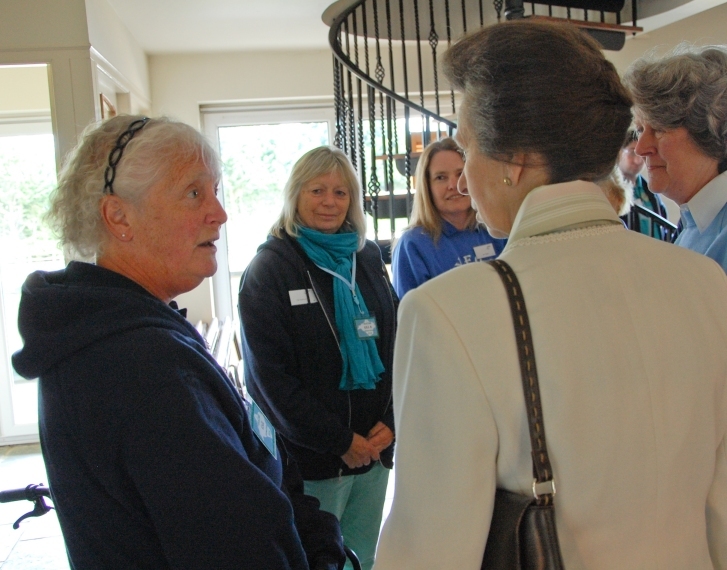 Members from several groups were presented to Princess Anne including Gail Yardley, Gill Radforth, Irene Todd and Frank Bingham from the Island group. 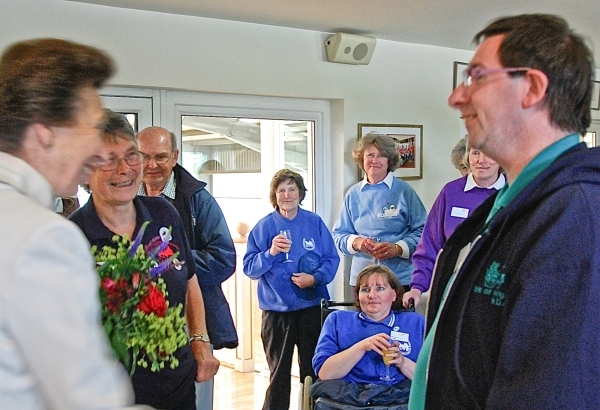 Frank presented HRH with a posy and had a chance to talk to her. Lunch followed after which they were able to watch a musical ride given by the Perry Group. The ceremony ended at 2:30 leaving our group to the long trek home. Everyone arrived home safely but all were extremely weary. The Island group represented the largest number of attendees with their number being almost a quarter of those present. 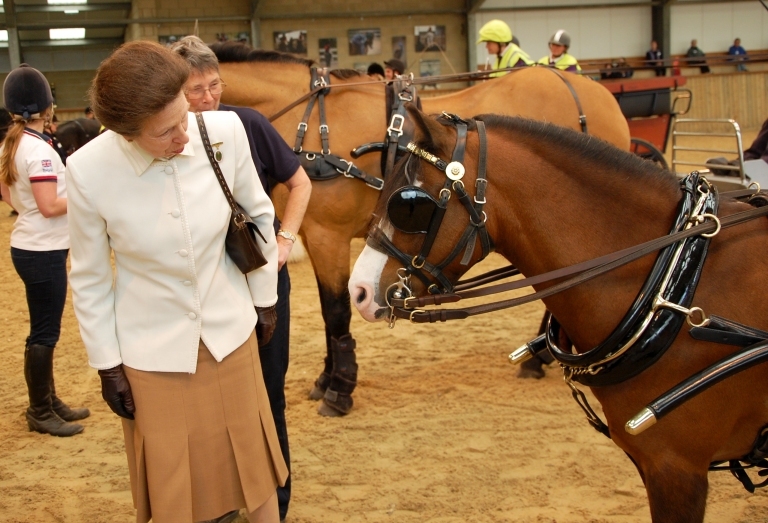 The Princess Royal gets to know one of the ponies. Discussing the RDA with one of it's representatives from headquarters. Frank seems to have made HRH smile. This was included because the photographs on the site were all found on odd pages. 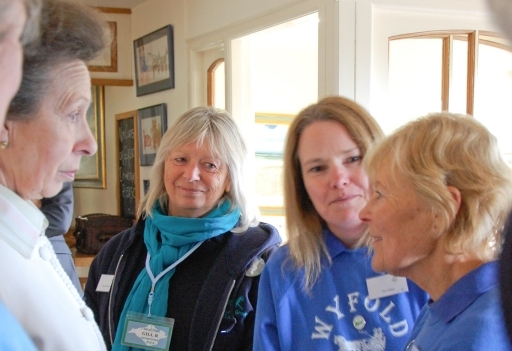 One click on the Gallery button will now take you to a page where you will be able to find all the pictures of the IOW Group and some of their activities. If anyone has any pictures relating to our group, please email them to me if you would like to see them displayed in our Gallery. Unable to use our regular venue and Brickfields being full of Happy Campers, we were unable to 'drive' today. Instead we met at 10:30 at the tea rooms of Quarr Abbey. It was a glorious day, bright warm sunshine in a beautiful setting. Many of the group commented on the various 'scents' which wafted across the gardens as you walked through them, principally Sweet Pea I think. Good company, good coffee and good wholesome scones etc., ensured that we all enjoyed our morning. No substitute for driving but most enjoyable all the same. Many people speculated about the foundation of the Abbey along with many other questions that came to mind. I have included a link to Quarr Abbey dot co dot uk below. 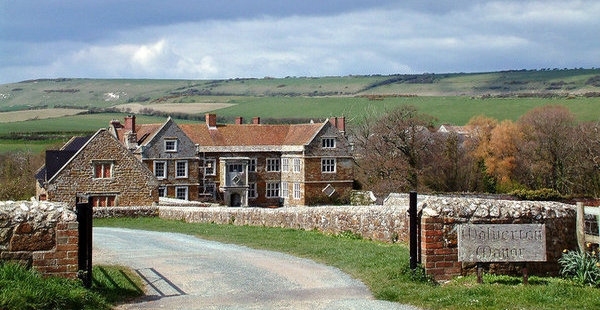 This site will give all the information anyone could want regarding the Abbey. I will be asking all of you questions next time we meet there so study the site well! 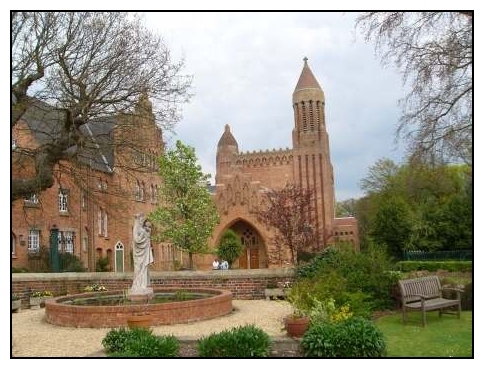 Click above to visit Quarr Abbey. Articles for sale and wanted. These pages will be viewed by more and more people. of the RDA and to include a 'Wanted' section. If you want to use this facility, then please call or email me. We are looking for businesses who would be kind enough to display one of our collecting tins. The committee have already made stalwart efforts to place some of the tins but we could do with more tins 'out there'. They are used by people to put their small change in, and therefore the more places they are seen, the more funds we will raise. If you can help with a location we can use - please call or email me.